Sometimes, a home away from home can be just as important as, if not more important than, one’s actual home. When it comes to hospitality, Villa Carlotta–the historic extended-stay residence in the heart of Los Angeles–knows a thing or two about making people feel at home. It’s about the little things, the things that give a space character. Room to gather with friends (old and new! ), delicious coffee, a fruitful garden. Nomadic life isn’t for everyone, and if you’re anything like me, the process of making a home out of wherever you are can feel integral to your comfort in a new place or experience. What is so special about Villa Carlotta is that its specifically set up for those who roam, especially (given its location and its storied Old-Hollywood history!) catering to the artists, musicians, filmmakers, and creatives for whom Los Angeles serves as an often-temporary, but deeply important professional hub. In her most recent diary, Garance even spoke to how at-home she felt staying at the Villa, while in the midst of her home renovation! Below, we visited Villa Carlotta (these photos are giving our NYC team life right now!!) and chatted with their team to hear more about their history, their restoration, and their exciting plans for the future! In addition to the fact that Villa Carlotta caters to extended-stay guests, how is the notion/ feeling of “home away from home” implemented more strongly here than other hotels or residences? Many of our residents work in the creative industries, there are opportunities to meet other people and collaborate whilst also having your own privacy and independence. This was a massive restoration project! How important is preserving and sharing the incredible history of this storied space? Owner, Gidi Cohen from CGI Strategies, fell in love with the building many years ago and embarked upon the restoration as a labor of love. There is such an incredible history in the building and we wanted to acknowledge this as much as possible. The Villa has played such a huge role in Hollywood history; it was Built by the first major Hollywood studio head Thomas Ince and his wife Elinor, and designed by Arthur E. Harvey—also architect of the chateau-inspired Scientology Celebrity Center across the street. Villa Carlotta played home to a host of Hollywood icons including David O. Selznick, Marion Davies, Montgomery Clift, and gossip columnist Louella Parsons, whose reviews were delivered to a courier from her apartment window. Since reopening, the new era of residents includes a real mix; musicians, models, actors, set designers, writers and artists as well as founders and entrepreneurs. The space feels incredibly private, yet also perfect for entertaining. How is this balance achieved and how important are both these elements to the vision? The Villa is a well-kept secret and we are incredibly discreet. The Villa itself is exceptionally spacious and everyone living here has the sense that they have an apartment and their own private life and space, but with the added sense that you are living amongst other creatives. We really wanted to celebrate the trend in transient residential living; to offer something for those on the west coast for award season, art fairs, filming, recording or for those simply in between homes or those who enjoy a sense of community without cohabitation. The interior evokes such a sense of old Hollywood. What about this space inspires a haven for artists, musicians, filmmakers, etc.? We have created a sense of community at the Villa through events, which give the residents the option to socialize, including a music series, cultural programming, screenings and supper-clubs that will start in the new year. Each Friday we have wine for residents and a pianist playing the grand piano in the lobby, which evokes the iconic Hollywood glamour for which the neighborhood is known. 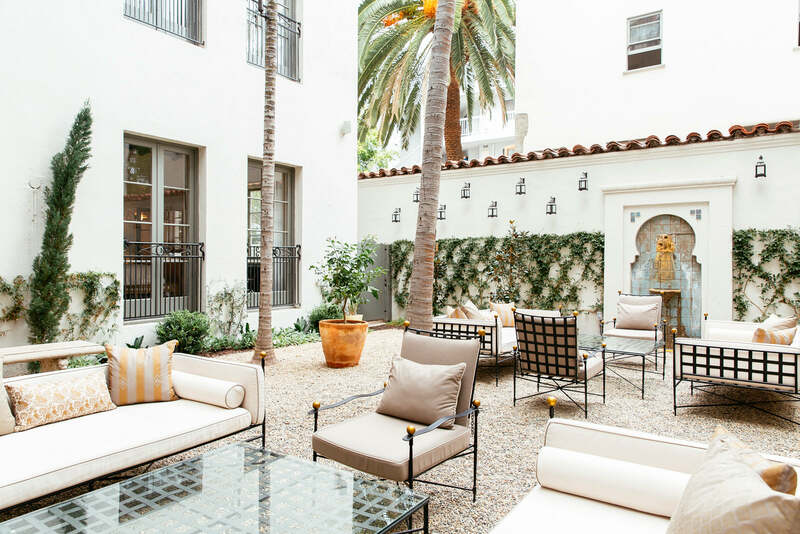 There is also a beautiful rooftop and palm garden where residents can host dinners, and next year we have a truly exciting program of events planned as well as the addition of a Tuscan style pool and club-house. The space is incredibly inspiring – Franklin Village is such a hidden pocket of Los Angeles, we are directly beneath the Hollywood sign so residents often head there or to Griffith Observatory for an unbeatable view of the city, for fresh air, nature and a change of scenery. We are also very central; close to studio city and recording studios, it is easy to get to Los Feliz, Beverly Hills, West Hollywood and downtown. Beachwood and Bronson Canyon are both full of creatives; there are so many inspiring places in the neighborhood to be discovered. We recognized that trends have changed in the way people work, live and travel – lots of our residents are European or based in NYC and head over to LA for 3 months at a time to record, film or work on a project and they want to be somewhere that complements their flexible lifestyle. Nowadays many lead a nomadic lifestyle and no longer have a 9-5 job in an office, many of our residents work in creative industries and want to live in a way that suits them; they may be running a business in London or NYC and may be working on a film. The Villa offers the perfect set up for that – they have the chance to opt in and meet other people, share all the amenities and convenience of the Villa. Looks wonderful. However, Scientology across the street makes me want to run far away. Is it affiliated? I read that story too, a lot of renters, including elderly people were displaced and lost their apartments that they lived in for years and also lost a really nice community of neighbors. There’s a great article in Vanity Fair written by someone who lived in the the Villa Carlotta for years, also heartbreaking. From the article: Artists make a place cool, and eventually “cool” acquires a dollar value. So money replaces it and the cool either moves on or dies off. Multiply that a thousand times, and across the 3,000 miles from coast to coast, and you understand why the most interesting urban neighborhoods in the country are becoming so beautifully bland. Thank you for sharing, so very sad. Yes thanks for sharing, this is quite tragic. I live in SF and there are many similar stories of places that have been here for years being bought out and “renewed” while the people that have leaved there for decades are now in search of a home. Its important we dont forget this. La scientologie ?!! Génial ! Oh wow. The paintings on the walls (sketches rather) are by a very famous Greek painter, Alekos Fassianos. wow. a little bit of home everywhere. By the way, this place exudes calmness, I would like to visit sometime.